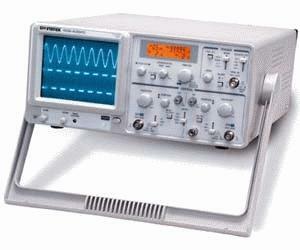 The economic Oscilloscope GOS-630FC establishes a brand new benchmark for oscilloscopes within the same category. New and innovative functions, including LCD readout display, frequency counter, and automatic time-base setting, are provided as standard features, with a 30MHz bandwidth and valuable features, is priced at the basic oscilloscope level. With 1mV/div vertical sensitivity the scope can capture small signal variations in the input source. Additional functions such as XY mode display, MAG function (time-based magnified), and Z-axis input extend the application range of the GOS-630FC to both the education and industry fields. The added values without being converted into extra cost make the GOS-630FC the most beneficial choice among entry-level analog oscilloscopes available in today’s market.